is a temporary data repository for messages and provides a reliable, highly scalable, hosted message queuing service for temporary storage and delivery of short (up to 256 KB) text-based data messages. supports a virtually unlimited number of queues and supports unordered, at-least-once delivery of messages. can be used to coordinate a multi-step processing pipeline, where each message is associated with a task that must be processed. enables the number of worker instances to scale up or down, and also enable the processing power of each single worker instance to scale up or down, to suit the total workload, without any application changes. If the application requires a very high-speed message send and receive response from a single producer or consumer, use of Amazon DynamoDB or a message-queuing system hosted on Amazon EC2 may be more appropriate. is a distributed queuing system that is optimized for horizontal scalability, not for single-threaded sending or receiving speeds. A single client can send or receive Amazon SQS messages at a rate of about 5 to 50 messages per second. Higher receive performance can be achieved by requesting multiple messages (up to 10) in a single call. are highly durable but temporary. stores all messages redundantly across multiple servers and data centers. Message retention time is configurable on a per-queue basis, from a minimum of one minute to a maximum of 14 days. Messages are retained in a queue until they are explicitly deleted, or until they are automatically deleted upon expiration of the retention time. the amount of data transferred in and out (priced per GB per month). is both highly elastic and massively scalable. is designed to enable a virtually unlimited number of computers to read and write a virtually unlimited number of messages at any time. supports virtually unlimited numbers of queues and messages per queue for any user. is a fast, fully-managed, petabyte-scale data warehouse service that makes it simple and cost-effective to efficiently analyze all your data using your existing business intelligence tools. is optimized for datasets that range from a few hundred gigabytes to a petabyte or more. manages the work needed to set up, operate, and scale a data warehouse, from provisioning the infrastructure capacity to automating ongoing administrative tasks such as backups and patching. Redshift is a column-oriented database and more suited for data warehousing and analytics. If application involves online transaction processing, Amazon RDS would be a better choice. Amazon Redshift allows a very high query performance on datasets ranging in size from hundreds of gigabytes to a petabyte or more. It uses columnar storage, data compression, and zone maps to reduce the amount of I/O needed to perform queries. It has a massively parallel processing (MPP) architecture that parallelizes and distributes SQL operations to take advantage of all available resources. Underlying hardware is designed for high performance data processing that uses local attached storage to maximize throughput. Amazon Redshift stores three copies of your data—all data written to a node in your cluster is automatically replicated to other nodes within the cluster, and all data is continuously backed up to Amazon S3. Manual snapshots can be created and are retained until explicitly deleted. Amazon Redshift also continuously monitors the health of the cluster and automatically re-replicates data from failed drives and replaces nodes as necessary. Data transfer to or from Amazon Redshift in Amazon VPC accrues standard AWS data transfer charges. provides push button scaling and the number of nodes can be easily scaled in the data warehouse cluster as the demand changes. CloudFront supports cache invalidation, however AWS recommends using object versioning rather than programmatic cache invalidation. use cases involve usage as a database front end for read heavy applications, improving performance and reducing load on databases, or managing user session data, cache dynamically generated pages, or compute intensive calculations etc. all ElastiCache nodes in a single cache cluster are provisioned in a single Availability Zone. ElastiCache automatically monitors the health of your cache nodes and replaces them in the event of network partitioning, host hardware, or software failure. In the event of cache node failure, the cluster remains available, but performance may be reduced due to time needed to repopulate the cache in the new “cold” cache nodes. To provide enhanced fault-tolerance for Availability Zone failures or cold-cache effects, you can run redundant cache clusters in different Availability Zones. ElastiCache supports replication to up to five read replicas for scaling. To improve availability, you can place read replicas in other Availability Zones. ElastiCache monitors the primary node, and if the node becomes unavailable, ElastiCache will repair or replace the primary node if possible, using the same DNS name. If the primary cache node recovery fails or its Availability Zone is unavailable, primary node can be failed over to one of the read replicas with an API call. ElastiCache is highly scalable and elastic. Auto Discovery enables automatic discovery of Memcached cache nodes by ElastiCache Clients when the nodes are added to or removed from an ElastiCache cluster. AWS Storage Options Whitepaper cont. Storage Gateway is a service that connects an on-premises software appliance with cloud-based storage to provide seamless and secure integration between the organization’s on-premises IT environment and AWS’s storage infrastructure. Storage Gateway enables store data securely to the AWS cloud for scalable and cost-effective storage. It provides low-latency performance by maintaining frequently accessed data on-premises while securely storing all of your data encrypted in S3. For disaster recovery scenarios, it can serve as a cloud-hosted solution, together with EC2, that mirrors your entire production environment. Gateway-cached volumes utilizes S3 for primary data backup, while retaining frequently accessed data locally in a cache. These volumes minimize the need to scale the on-premises storage infrastructure, while still providing applications with low-latency access to their frequently accessed data. Data written to the volumes is stored in S3, with only a cache of recently written and recently read data is stored locally on the on-premises storage hardware. Gateway-stored volumes stores the complete primary data locally, while asynchronously backing up that data to AWS. These volumes provide the on-premises applications with low-latency access to their entire datasets, while providing durable, off-site backups. Data written to the gateway-stored volumes is stored on the on-premises storage hardware, and asynchronously backed up to S3 in the form of EBS snapshots. data mirroring to cloud-based compute resources. For Database backup or storage, EC2 instances using EBS volumes are a natural choice for database storage and workloads. As the Storage Gateway VM sits between the application, underlying on-premises storage and S3, the performance experienced will be dependent upon a number of factors, including the speed and configuration of the underlying local disks, the network bandwidth between the iSCSI initiator and gateway VM, the amount of local storage allocated to the gateway VM, and the bandwidth between the gateway VM and S3. For gateway-cached volumes, to provide low-latency read access to the on-premises applications, it’s important to provide enough local cache storage to store the recently accessed data. Storage Gateway efficiently uses the Internet bandwidth to speed up the upload of on-premises application data to AWS. Storage Gateway only uploads incremental changes (data that has changed), which minimizes the amount of data sent over the Internet. AWS Direct Connect can be used to further increase throughput and reduce the network costs by establishing a dedicated network connection between the on-premises gateway and AWS. AWS Storage Gateway durably stores on-premises application data by uploading it to S3. S3 stores data in multiple facilities and on multiple devices within each facility. S3 also performs regular, systematic data integrity checks and is built to be automatically self-healing. data transfer out (per GB per month). AWS Storage Gateway stores data in Amazon S3, which has been designed to offer a very high level of scalability and elasticity automatically. AWS Management Console can be used to download the AWS Storage Gateway VM image, select between a gateway-cached or gateway-stored configuration, activate the on-premises by associating the gateway’s IP Address with your AWS account, select an AWS region, and create AWS Storage Gateway volumes and attach these volumes as iSCSI devices to your on-premises application servers. AWS Import/Export accelerates moving large amounts of data into and out of AWS using portable storage devices for transport. AWS transfers the data directly onto and off of storage devices using Amazon’s high-speed internal network and bypassing the Internet and can be much faster and more cost effective than upgrading connectivity. AWS Import/Export supports importing into several types of AWS storage, including EBS snapshots, S3 buckets, and Glacier vaults and exporting data from S3. AWS Import/Export is ideal for transferring large amounts of data in and out of the AWS cloud, especially in cases where transferring the data over the Internet would be too slow (a week or more) or too costly. transfer to Amazon S3 or Amazon Glacier for off-site backup and archival storage, and quick retrieval of large backups from Amazon S3 or Amazon Glacier for disaster recovery. AWS Import/Export may not be the ideal solution for data that is more easily transferred over the Internet in less than one week. Rate of the data load will be bounded by a combination of the read or write speed of the portable storage device and, for Amazon S3 data loads, the average object (file) size. AWS Import/Export has three pricing components: a per-device fee, a data load time charge (per data-loading-hour), and possible return shipping charges (for expedited shipping, or shipping to destinations not local to that AWS Import/Export region). Storage pricing applies for the destination storage, the standard Amazon EBS snapshot, Amazon S3, and Amazon Glacier request and storage pricing applies. Total amount of data you can load using AWS Import/Export is limited only by the capacity of the devices sent to AWS. For Amazon S3, individual files will be loaded as objects in Amazon S3, and may range up to 5 terabytes in size. For Amazon Glacier, individual devices will be loaded as a single archive, and may range up to 4 terabytes in size. Aggregate total amount of data that can be imported is virtually unlimited. Each job request requires a manifest file, a YAML-formatted text file that contains a set of key-value pairs that supply the required information—such as your device ID, secret access key, and return address—necessary to complete the job. Job request is tied to the storage device through a signature file in the root directory (for Amazon S3 import jobs), or by a barcode taped to the device (for Amazon EBS and Amazon Glacier jobs). You are working with a customer who has 10 TB of archival data that they want to migrate to Amazon Glacier. The customer has a 1-Mbps connection to the Internet. Which service or feature provides the fastest method of getting the data into Amazon Glacier? 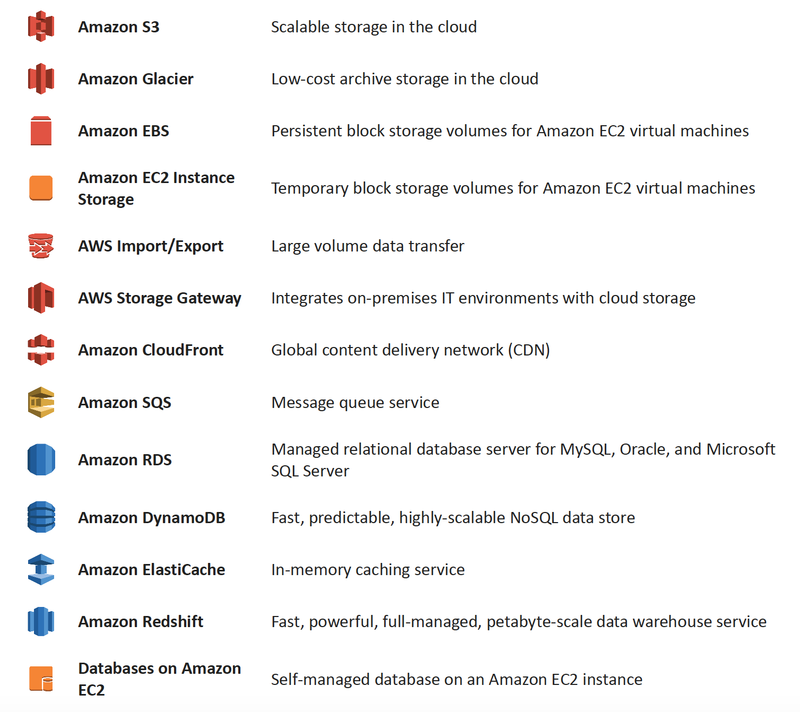 AWS Storage Options Whitepaper with RDS, DynamoDB & Database on EC2 Cont. RDS eliminates much of the administrative overhead associated with launching, managing, and scaling your own relational database on Amazon EC2 or in another computing environment. RDS is also optimal for new applications with structured data that requires more sophisticated querying and joining capabilities than that provided by Amazon’s NoSQL database offering, DynamoDB. RDS provides pushbutton scaling and it only scales up and has limited scale out ability. If fully-automated scaling is needed, DynamoDB may be a better choice. RDS does not provide admin access and does not enable the full feature set of the database engines. 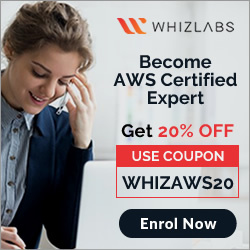 So if the application requires complete, OS-level control of the database server with full root or admin login privileges, a self-managed database on EC2 may be a better match. RDS, at this time, provides a MySQL, Oracle, MariaDB, PostgreSQL and SQL Server databases. If any other database platform (such as IBM DB2, Informix, or Sybase) is needed, it should be deployed on a self-managed database on an EC2 instance by using a relational database AMI, or by installing database software on an EC2 instance. RDS offers a tiered pricing structure, based on the size of the database instance, the deployment type (Single-AZ/Multi-AZ), and the AWS region. RDS for MySQL also enables you to scale out beyond the capacity of a single database deployment for read-heavy database workloads by creating one or more read replicas. Multiple RDS instances can also be configured to leverage database partitioning or sharding to spread the workload over multiple DB instances, achieving even greater database scalability and elasticity. There is no AWS data API for Amazon RDS. Once a database is created, RDS provides a DNS endpoint for the database which can be used to connect to the database. Amazon DynamoDB is a fast, fully-managed NoSQL database service that makes it simple and cost-effective to store and retrieve any amount of data, and serve any level of request traffic. DynamoDB being a managed service helps offload the administrative burden of operating and scaling a highly-available distributed database cluster. DynamoDB helps meet the latency and throughput requirements of highly demanding applications by providing extremely fast and predictable performance with seamless throughput and storage scalability. DynamoDB provides both eventually-consistent reads (by default), and strongly-consistent reads (optional), as well as implicit item-level transactions for item put, update, delete, conditional operations, and increment/decrement. DynamoDB stores structured data in tables, indexed by primary key, and allows low-latency read and write access to items. DynamoDB supports three data types: number, string, and binary, in both scalar and multi-valued sets. Tables do not have a fixed schema, so each data item can have a different number of attributes. Primary key can either be a single-attribute hash key or a composite hash-range key. Local secondary indexes provide additional flexibility for querying against attributes other than the primary key. DynamoDB is ideal for existing or new applications that need a flexible NoSQL database with low read and write latencies, and the ability to scale storage and throughput up or down as needed without code changes or downtime. SSDs and limited indexing on attributes provides high throughput and low latency and drastically reduces the cost of read and write operations. Predictable performance can be achieved by defining the provisioned throughput capacity required for a given table. DynamoDB handles the provisioning of resources to achieve the requested throughput rate, taking away the burden to think about instances, hardware, memory, and other factors that can affect an application’s throughput rate. Provisioned throughput capacity reservations are elastic and can be increased or decreased on demand. DynamoDB has built-in fault tolerance that automatically and synchronously replicates data across three AZ’s in a region for high availability and to help protect data against individual machine, or even facility failures. DynamoDB is both highly-scalable and elastic. Data is automatically partitioned and re-partitioned as needed, while the use of SSDs provides predictable low-latency response times at any scale. DynamoDB is also elastic, in that you can simply “dial-up” or “dial-down” the read and write capacity of a table as your needs change. APIs provide both a management and data interface for Amazon DynamoDB, that enable table management (creating, listing, deleting, and obtaining metadata) and working with attributes (getting, writing, and deleting attributes; query using an index, and full scan). Relational databases on EC2 leverages the scalability and elasticity of the underlying AWS platform, but this requires system administrators or DBAs to perform a manual or scripted task. If you need pushbutton scaling or fully-automated scaling, DynamoDB or RDS may be a better choice. Performance can be increased by scaling up memory and compute resources by choosing a larger Amazon EC2 instance size. For database storage, it is usually best to use EBS Provisioned IOPS volumes. To scale up I/O performance, the Provisioned IOPS can be increased, the number of EBS volumes changed, or use software RAID 0 (disk striping) across multiple EBS volumes, which will aggregate total IOPS and bandwidth. Running relational joins and complex updates. Storing large amounts of infrequently accessed data. A client application requires operating system privileges on a relational database server. What is an appropriate configuration for highly available database architecture? 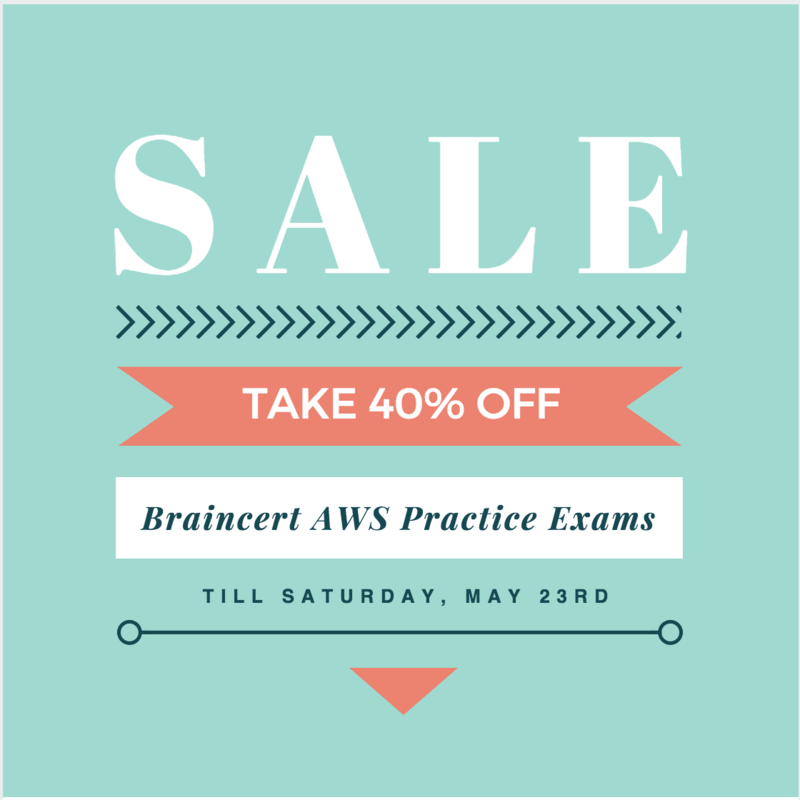 You are developing a new mobile application and are considering storing user preferences in AWS, which would provide a more uniform cross-device experience to users using multiple mobile devices to access the application. The preference data for each user is estimated to be 50KB in size. Additionally 5 million customers are expected to use the application on a regular basis. The solution needs to be cost-effective, highly available, scalable and secure, how would you design a solution to meet the above requirements? A customer is running an application in US-West (Northern California) region and wants to setup disaster recovery failover to the Asian Pacific (Singapore) region. The customer is interested in achieving a low Recovery Point Objective (RPO) for an Amazon RDS multi-AZ MySQL database instance. Which approach is best suited to this need? You are designing a file -sharing service. This service will have millions of files in it. Revenue for the service will come from fees based on how much storage a user is using. You also want to store metadata on each file, such as title, description and whether the object is public or private. How do you achieve all of these goals in a way that is economical and can scale to millions of users? Store all files in Amazon Simple Storage Service (53). Create a bucket for each user. Store metadata in the filename of each object, and access it with LIST commands against the S3 API. Store all files in Amazon 53. Create Amazon DynamoDB tables for the corresponding key -value pairs on the associated metadata, when objects are uploaded. Create a striped set of 4000 IOPS Elastic Load Balancing volumes to store the data. Use a database running in Amazon Relational Database Service (RDS) to store the metadata. Create a striped set of 4000 IOPS Elastic Load Balancing volumes to store the data. Create Amazon DynamoDB tables for the corresponding key-value pairs on the associated metadata, when objects are uploaded. Company ABCD has recently launched an online commerce site for bicycles on AWS. They have a “Product” DynamoDB table that stores details for each bicycle, such as, manufacturer, color, price, quantity and size to display in the online store. Due to customer demand, they want to include an image for each bicycle along with the existing details. Which approach below provides the least impact to provisioned throughput on the “Product” table? highly-scalable, reliable, and low-latency data storage infrastructure at very low costs. provides a simple web services interface that can be used to store and retrieve any amount of data, at any time, from within Amazon EC2 or from anywhere on the web. allows you to write, read, and delete objects containing from 1 byte to 5 terabytes of data each. number of objects you can store in an Amazon S3 bucket is virtually unlimited. highly secure, supporting encryption at rest, and providing multiple mechanisms to provide fine-grained control of access to Amazon S3 resources. highly scalable, allowing concurrent read or write access to Amazon S3 data by many separate clients or application threads. provides data lifecycle management capabilities, allowing users to define rules to automatically archive Amazon S3 data to Amazon Glacier, or to delete data at end of life. commonly used as a data store for computation and large-scale analytics, such as analyzing financial transactions, clickstream analytics, and media transcoding. used as a highly durable, scalable, and secure solution for backup and archival of critical data, and to provide disaster recovery solutions for business continuity. stores objects redundantly on multiple devices across multiple facilities, it provides the highly-durable storage infrastructure needed for these scenarios. Data that needs to updated frequently might be better served by a storage solution with lower read/write latencies, such as Amazon EBS volumes, RDS or Dynamo DB. Amazon S3 uses a flat namespace and isn’t meant to serve as a standalone, POSIX-compliant file system. However, by using delimiters (commonly either the ‘/’ or ‘’ character) you are able construct your keys to emulate the hierarchical folder structure of file system within a given bucket. Access to Amazon S3 from within Amazon EC2 in the same region is fast. Amazon S3 is designed so that server-side latencies are insignificant relative to Internet latencies. Amazon S3 is also built to scale storage, requests, and users to support a virtually unlimited number of web-scale applications. If Amazon S3 is accessed using multiple threads, multiple applications, or multiple clients concurrently, total Amazon S3 aggregate throughput will typically scale to rates that far exceed what any single server can generate or consume. Error correction is built-in, and there are no single points of failure. Amazon S3 is designed to sustain the concurrent loss of data in two facilities, making it very well-suited to serve as the primary data storage for mission-critical data. Amazon S3 is designed for 99.999999999% (11 nines) durability per object and 99.99% availability over a one-year period. Amazon S3 data can be protected from unintended deletions or overwrites using Versioning. With Amazon S3, you pay only for what you use and there is no minimum fee. Amazon S3 has three pricing components: storage (per GB per month), data transfer in or out (per GB per month), and requests (per n thousand requests per month). Amazon S3 allows you to store any number of objects (files) in a single bucket, and Amazon S3 will automatically manage scaling and distributing redundant copies of your information to other servers in other locations in the same region, all using Amazon’s high-performance infrastructure. Amazon S3 provides standards-based REST and SOAP web services APIs for both management and data operations. NOTE – SOAP support over HTTP is deprecated, but it is still available over HTTPS. New Amazon S3 features will not be supported for SOAP. We recommend that you use either the REST API or the AWS SDKs. Amazon S3 Command Line Interface (CLI) provides a set of high-level, Linux-like Amazon S3 file commands for common operations, such as ls, cp, mv, sync, etc. They also provide the ability to perform recursive uploads and downloads using a single folder-level Amazon S3 command, and supports parallel transfers. All interfaces provide the ability to store Amazon S3 objects (files) in uniquely-named buckets (top-level folders), with each object identified by an unique Object key within that bucket. can reliably store their data for as little as $0.01 per gigabyte per month. Data stored in Glacier can not be accessed at real time and requires an initiation of a job for object retrieval with retrieval times ranging from 3-5 hours. If immediate access is needed, Amazon S3 is a better choice. Amazon Glacier is a low-cost storage service designed to store data that is infrequently accessed and long lived. Amazon Glacier synchronously stores your data across multiple facilities before returning SUCCESS on uploading archives. Amazon Glacier also performs regular, systematic data integrity checks and is built to be automatically self-healing. Amazon Glacier has three pricing components: storage (per GB per month), data transfer out (per GB per month), and requests (per thousand UPLOAD and RETRIEVAL requests per month). A single archive is limited to 40 TBs, but there is no limit to the total amount of data you can store in the service. Amazon Glacier scales to meet your growing and often unpredictable storage requirements whether you’re storing petabytes or gigabytes, Amazon Glacier automatically scales your storage up or down as needed. Amazon Glacier provides a native, standards-based REST web services interface, as well as Java and .NET SDKs. AWS Management Console or the Amazon Glacier APIs can be used to create vaults to organize the archives in Amazon Glacier. Amazon Glacier APIs can be used to upload and retrieve archives, monitor the status of your jobs and also configure your vault to send you a notification via Amazon Simple Notification Service (Amazon SNS) when your jobs complete. Amazon Glacier can be used as a storage class in Amazon S3 by using object lifecycle management to provide automatic, policy-driven archiving from Amazon S3 to Amazon Glacier. On retrieval, a copy of the retrieved object is placed in Amazon S3 RRS storage for a specified retention period; the original archived object remains stored in Amazon Glacier and you are charged for both the storage. Objects archived to Amazon Glacier via Amazon S3 can only be listed and retrieved via the Amazon S3 APIs or the AWS Management Console—they are not visible as archives in an Amazon Glacier vault. You want to pass queue messages that are 1GB each. How should you achieve this? Use Kinesis as a buffer stream for message bodies. Store the checkpoint id for the placement in the Kinesis Stream in SQS. Use SQS’s support for message partitioning and multi-part uploads on Amazon S3. Use AWS EFS as a shared pool storage medium. Store filesystem pointers to the files on disk in the SQS message bodies.